The mural was painted by artist Don Gray on the wall of Jazzy Bagels that faces Powell Boulevard. 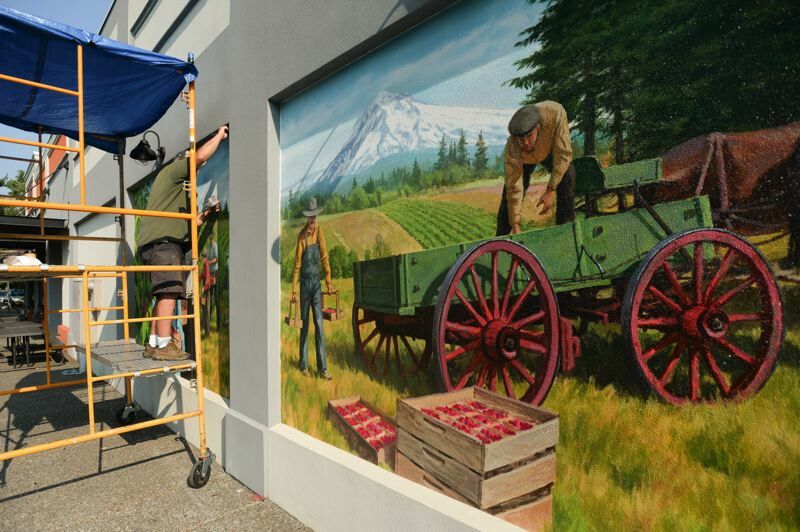 Commuters and visitors to downtown Gresham will have to keep their eyes peeled for the latest mural, completed Wednesday, Aug. 9, which celebrates the local history surrounding berry farming and picking. The mural, which was painted by artist Don Gray on the wall of Jazzy Bagels that faces Powell Boulevard, is split into two panels. 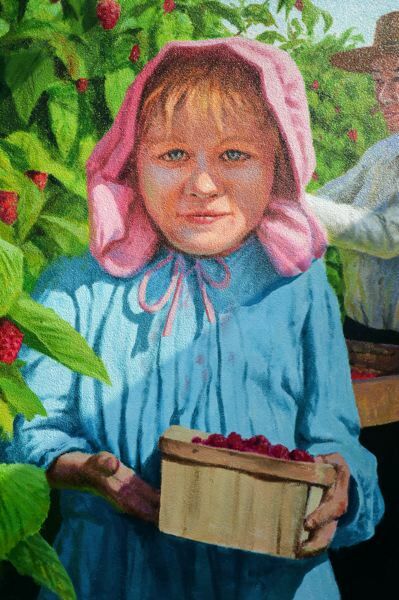 One scene shows farmers loading crates of berries onto a wagon with Mount Hood rising in the background, while the other has children picking the berries, with an arresting portrait of a young girl in a blue dress and pink bonnet drawing the spotlight. "Gresham has been hungry for more art," said Judy Han, president of Gresham Outdoor Public Art which commissioned the mural. "Art is for everybody, it crosses all diving lines and brings us together." 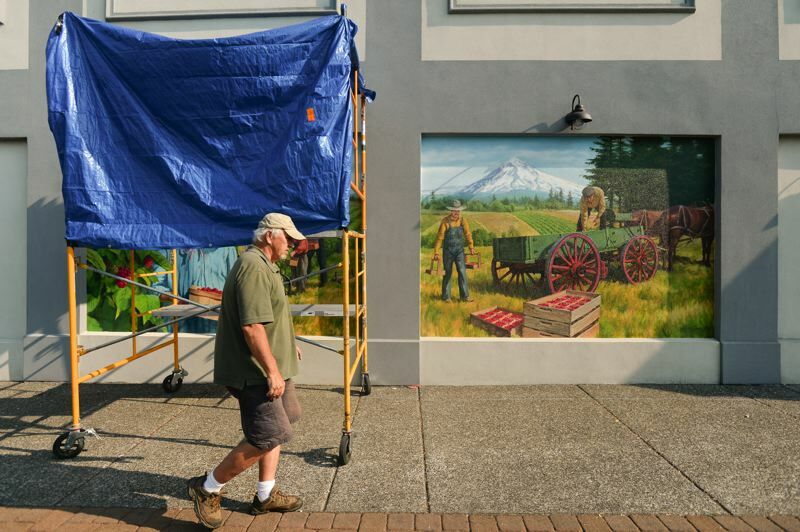 Gray's mural is one of the latest efforts to bring more public art to Gresham. 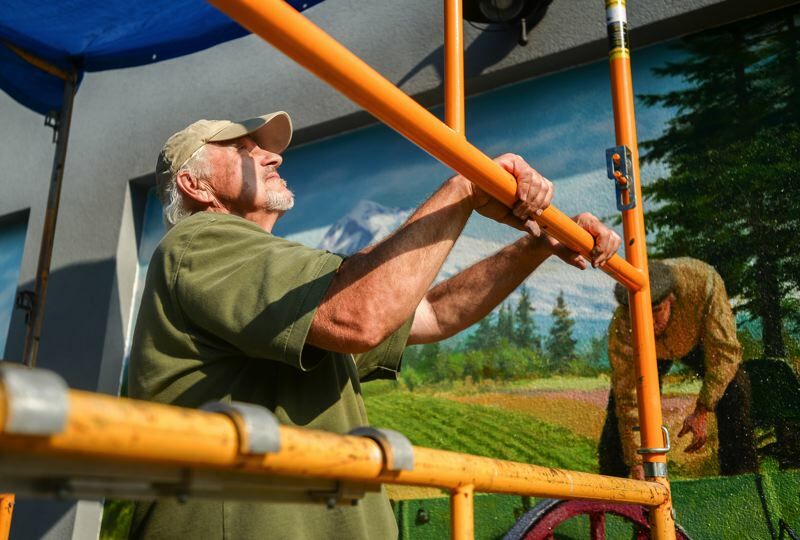 It joins a pair of bronze sculptures cast by Cascade Locks artist Heather Soderberg, a historical mural being painted on the wall of Dan Anderson Karate facing Third Street by Lee Lauritzen, and Gray's other mural that was painted on the wall of Jazzy Bagel facing Main Street. "We wanted Don to paint the second mural so the two would match each other in style," Han said. "It means so much to this community to have all of this beautiful art."